Call your friends and family from your computer—a look at the future or the present? With Linux, the future is now. 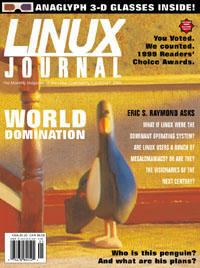 Eric takes a serious look at what the world will be like when Linux is the dominant operating system—or is he just kidding. At Nortel Networks, we have developed a Linux-based system for testing a second-generation packet radio service. During system development we explored the details of packet radio, the IP internals of the Linux operating system and device-driver development. Wondering about the latest version of BIND? Wonder no more. Mr. Harari is back this month to tell us all about it. This article will introduce you to RPM by showing you the most common features, namely how to query, install, upgrade and remove packages. More about securing our comminication with the Internet. You voted, we counted—here are the results. How one company used Linux to provide transmission of live audio and video over the Internet. A look at what's new in the next kernel release. A bank in Croatia is using Linux for its development platform. Here's the story. For those thinking of setting up an alphanumeric paging service or gateway, this article explains the protocols and methods involved. Attend business meetings and bullsessions without ever leaving home—enter the virtual world. Software to automatically sort network communications to your specifications.